In the past year or so, I find myself increasingly attached to audiobooks. One of the books not only spoke to me emotionally but also offered tactics I am able to apply daily, especially during the creation of the feisworld podcast. Dorie Clark is the author of this book, one of my new favorites, called Stand Out. There's a very important and useful idea not found in her book that you will hear in this podcast conversation. 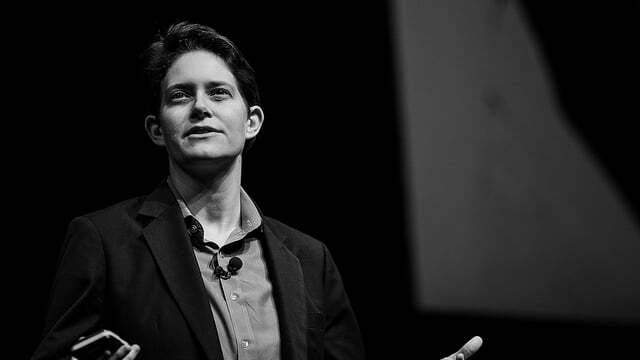 UPDATE as of October 3rd, 2017 - Dorie Clark's brand new book Entrepreneurial You just launched! Many people jumping into the entrepreneurial world have something different about them. Many people in Silicon Valley (investors, technologists, customers) have a mental image of what a successful startup entrepreneur looks like (i.e. Mark Zuckerberg). If you don't look like that, they may pass you over because you don't fit what they are looking for. Rather than sticking on that point, Dorie explains that if you continue to work hard and push through that early stage, to the point where customers, and later the press have noticed the results you created, you will find that you do stand out. People will have an easier time remembering your face, your name and your company because you don't look like everyone else. Unlike seeking advice from the world's top 1% who has established a system that worked for them, 10, 20, or even 30 years ago, Dorie painted a path that's recent and relevant to people like us who want to stand out, build a personal brand and a legacy that matters in today's crowded marketplace filled with with influencers, products and information. How can you get started? Dorie made it easy by offering you this Free Stand Out Self Assessment to do exactly that. To understand how Dorie got to where she is today, we discussed the turning-point question. In other words, I want to know about the event or person Dorie experienced that doubled or tripled her speed to success. Find out what a bike sale on Craigslist has to do with this [35:00]. To learn more about Dorie, please visit her blog http://dorieclark.com, and follow her on Twitter and Facebook. 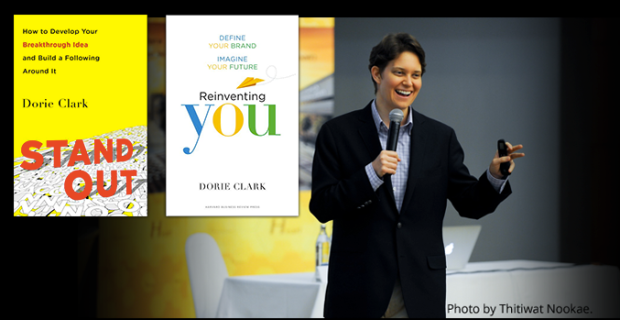 5:15 Who's Dorie Clark, in her own words? 14:45 How did you seek out an opportunity and realize a framework that’s proven to work? 18:45 What is your advice for women? 26:45 What are some of the common misconceptions and fears for people working full time but who want to "stand out"? 34:15 What do the first 60 minutes of your day look like? 36:15 When you mentioned in your book Stand Out:"You need time to reflect upon what you learned" - is this something you do on a regular basis? 38:45 What are some of the counterintuitive learnings and experiences you recall? Furthermore, what was the person/event that springboard her on the path of success? 44:45 When you think of someone who leads a meaningful and fulfilling life, who comes to mind and why? 52:45 What is your take on podcasting? What sort of meaning does it add to your life? 15:15 A lot of people think that if you’re going to have some sort of big idea, it has to be like a lightning strike. 16:45 If you pick a really broad category… why should someone talk to you? But if you pick something narrow, all of a sudden you have a much better chance. 21:45 In the early stages, yes, being different will make it harder to advance, because there’s a pattern recognition problem. 22:45 However, if you are able to break through and get beyond that, then you are going to be disproportionately memorable BECAUSE you stand out. 28:15 You need to start iterating so that by the time you’re actually ready to make your move, you feel pretty confident that you have a good idea, that you have a little traction, that you know where it’s going. 42:45 I was definitely prepared for luck - I had a lot of pitches ready, posts ready (by the time the opportunity presented itself). 53:15 A million people seeing you for two minutes is not gonna do you a lot of good. But if you have a thousand people listening to you for 30 minutes or an hour, they are the ones who are going to buy the book. 18:30 Dereck Coburn - networking group called Cadre, and book “Networking is Not Working"
47:00 Transparent - TV show. Faith Soloway and Jill Soloway. To see videos from Dorie, click here and watch them on her website. Special thanks to Stephnie Shapiro for introducing Dorie Clark to me. Stephnie has appeared on an earlier episode of the feisworld podcast remains to be one of the most popular episodes of all time. I highly recommend you check it out.